This was one of those weekday nights where I was craving for something different for dinner and yet did not have the energy to spend a lot of time in my kitchen. I was feeling equally lazy to look for recipes and started with a blank slate – wondering what I could do with whatever little produce I had in my refrigerator. I first microwaved a bag of asparagus for a few minutes – you can blanch them if you don’t have the microwaveable variety. Next, I whisked up a dressing with the juice of a lemon, a dash of orange juice, a couple of diced shallots (or use little red onions), some agave nectar (use honey if you don’t have agave), salt and pepper. 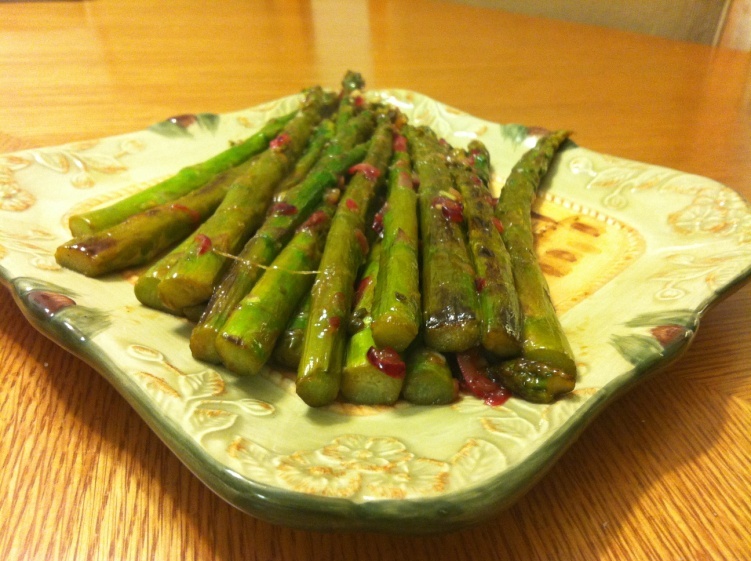 Next, heat a skillet, put a tablespoon of olive oil, sauté the asparagus, and spread the dressing over it. That is it! 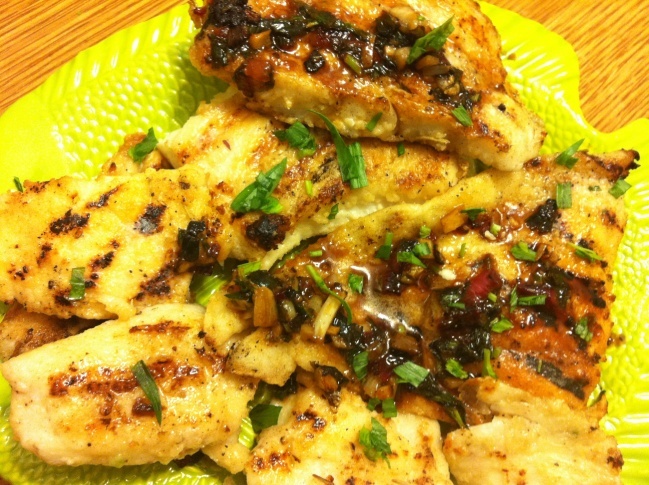 Fish with lemon garlic sauce. I used haddock fillets, but you can use any white fish that you have with you. I first spread some flour and a couple of teaspoons of panko crumbs on a plate and put salt, pepper and a dry rosemary-garlic rub that I had (use any dry herbs you have). Patted the fish on the flour mixture, shook off the excess flour and out it on a hot grill pan which I had earlier put some oil spray on. (You can use a regular frying pan too, but I love the grill marks that the grill pan gives me, plus cast iron distributes heat evenly). Let the fish cook without any interference for about 2-3 minutes. In the meantime, slip in 2 crushed garlic pods while the fish is sizzling in the same pan. Flip around and cook on the other side for about 1-2 minutes more. Cut a tiny slice of butter and place it on the side of the fish that is facing you. When you see that beautiful brown crust, you know that the fish is done. Pour some lemon juice and salt into the pan once you have finished frying all the fish. You get a great pan sauce. Pour this on the fish and garnish with chopped parsley. I sautéed some minced garlic in a pan, when they turned brownish, I added the cauliflower florets. When they started browning, I added the chopped tomatoes. I let the vegetables sweat a little in the pan ad they released their juices before adding the couscous in. I had the Mediterranean couscous, which are larger than the regular couscous. You can find them easily in the bulk sections of Whole Foods. If you don’t have it, substitute with regular couscous or even tapioca that has been soaked in water (sabu dana in Hindi). Next add the chicken stock – about double the quantity of the couscous. 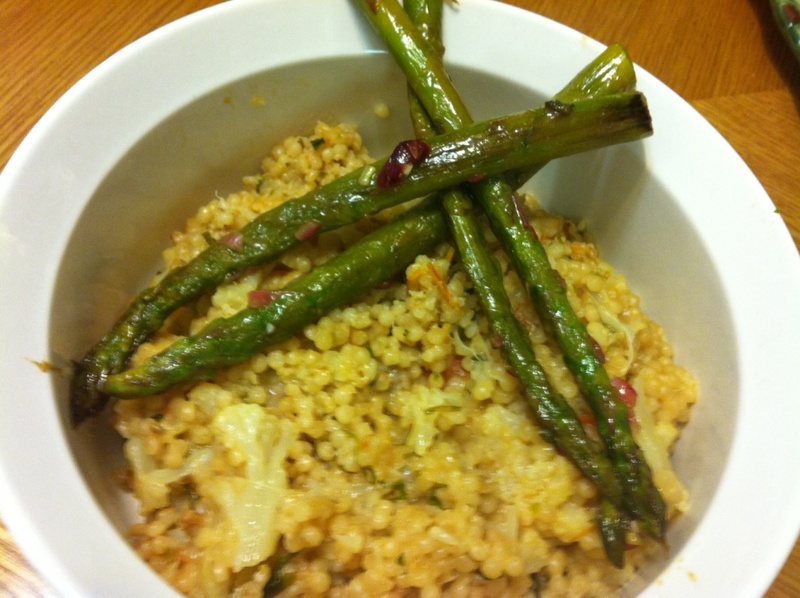 Season with salt, cook till it gets soft and the couscous absorbs all the stock. That is it! I hope you get the time to try out these recipes and try variations – go with the flow of your creative, gastronomic minds!